Lewis Colvert, son or stepson? | Scuffalong: Genealogy. Lewis Colvert, son or stepson? – Scuffalong: Genealogy. Lewis Colvert, son or stepson? Something’s been bothering me about Lewis “Lou” Colvert. My grandmother knew his son Aggie (pronounced “Adgie”) Colvert as her cousin, but just whose son was Lewis? The first irregularity: as shown here, when Walker Colvert and Rebecca Parks registered their 13-year cohabitation in 1866, they did not list six year-old Lewis among their three children. Why not? In the 1870 census of Union Grove, Iredell County, he’s there: Walker Colvert, wife Rebecca and Lewis Colvert, 10. I haven’t found him in the 1880 census, but a year later, on 13 October 1881, he married Laura Sharpe in Statesville. References to him over the next 30+ years though are few. On 11 October 1895, the Statesville Landmark printed a short piece about Lou suffering a head injury after being thrown from a wagon. Carolina Mascot (Statesville), 8 February 1900. Walker Colvert died in 1905. His will, made in 1901, directed that all his land and personal property go first to his wife Rebecca and, after her death, to his son John Walker Colvert. No mention of Lewis. In 1910, Lewis again sidestepped the census taker. Laura remained in Asheville. Though she lived until 1926, and I’ve found no evidence of a divorce, in April 1913, Lewis married Quiller Ward in Statesville. The marriage was short-lived. Lewis “Lou” Colvert died 27 March 1915 in Statesville. 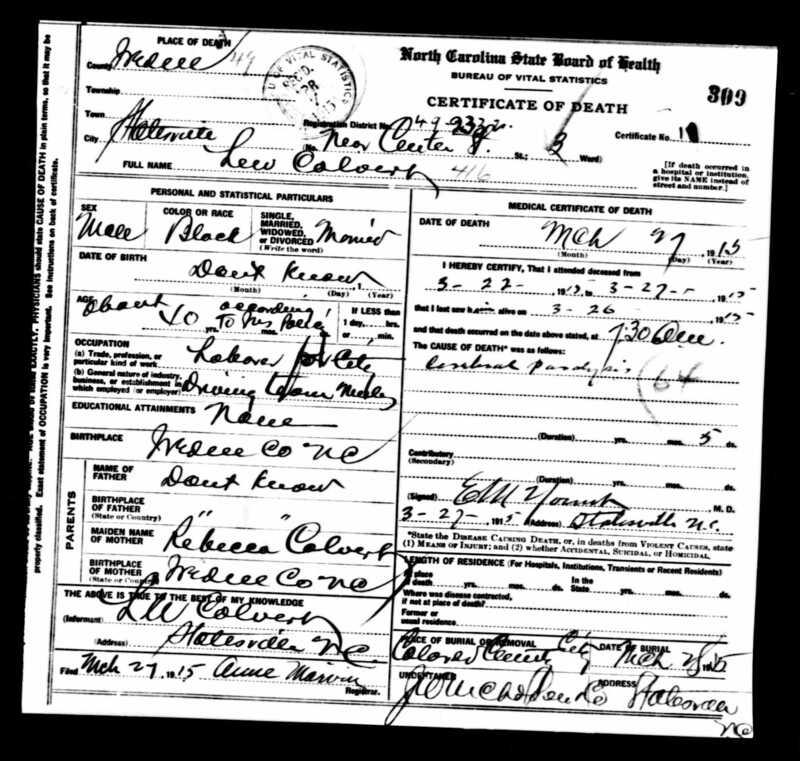 Lon W. Colvert provided the information for his death certificate — mother, Rebecca Colvert; father, unknown. Unknown. Not Walker Colvert. Neither here nor anywhere else is there a claim that Walker was Lewis’ father. Here is my speculation: Walker Colvert was born at 1815. He married Rebecca Parks about 1853. At that time, he had a two year-old son, John Walker, whose mother was named Elvira Gray. (At nearly 40, however, Walker surely had children older than John. If so, their identities may never be known.) Rebecca was 24 years Walker’s junior and almost certainly belonged to a different master. She was about 16 when she gave birth to her first child with Walker, a daughter named Elvira, and daughter Lovina followed. Then, in 1861, she bore Lewis. As with every enslaved woman, Rebecca’s body was not her own. Perhaps she willingly conceived a child outside her relationship with Walker. Just as likely, that relationship was not uniformly recognized, and she submitted to someone else’s will. Walker reared the boy with his own children and gave him his surname, but did not claim him as a son. → 52 Ancestors in 52 Weeks: 5. Plowing through. Think how he must of felt? I feel for Lewis…. I wish there were some way to know if I’m getting this story right. Walker clearly loved himself some Rebecca, but seems not quite to have been willing to embrace her son the same way. Pingback: DNA Definites, no. 25: Colvert. | Scuffalong: Genealogy.